The Corn Estate. Oct 17, 18, 24, 25 and 31. The Corn House of Horrors began 8 years ago in the Quinn's 150-year old Victorian home on Duncan Avenue in Cornwall-on-Hudson. Growing in popularity as the years passed, attendance increased to over 500 people. For this eighth year of production, The Corn House of Horrors has mutated into the Corn Estate and has retuned to Storm King Engine Company #2 to create a bigger and better experience for all. 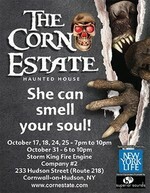 Sponsored in part by New York Life, The Corn Estate is a fundraiser for the SKE#2, and will be located at the fire house again this year. In addition, the Storm King Engine Auxiliary will be hosting their annual Halloween activities at the end of the haunt on the last night we are open. This event is for both those brave enough to go through the haunt, as well as younger children (or less brave adults!) who decide not to go through The Corn Estate. The back story to the haunt is that The Corn Estate was once the home to Thaddeus Corn and his family. Thaddeus, a notorious smuggler, con artist, and thief had many enemies. Many years ago on Halloween night, Thaddeus was holding one of his enemies hostage in the basement of their house. The house was raided to free the hostage, and Thaddeus and his entire family were murdered. However, the hostage was never found. Each year on the anniversary of their deaths, the evil Corn family returns, seeking revenge upon anyone foolhardy enough to enter their home. This year, a famed archeologist has accidentally uncovered The Corn Estate: the secret dungeon playrooms of the Corn family, and in doing so, has released their spirits. As visitors pass through the estate, they will meet various family members, as well as visiting the final resting places of some of the Corn family. Visitors must be wary not to take a wrong turn, or they will end up at the Corn Family Asylum, a place you do not want to visit. No one knows quite what or who is inside this now abandoned Asylum, but those who have gone in have never come out. A compilation video showing scenes from our past years can be viewed at https://vimeo.com/69859189. 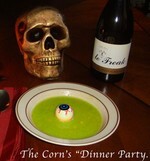 We have other videos, still images, and more information on our website at www.cornestate.com and facebook page.